I went to the Model S presentation at the Menlo Park store / Roadster factory with my dad Saturday afternoon. We saw two other RAV4 EVs, a white one with license place "Electruk" and a silver one like ours. There were maybe a half dozen Nissan Leaves in the parking lot, one Volt, along with several Roadsters. It was encouraging to see people filling up the parking lot and streaming into the showroom. There may have been more than 100 people. The main area of the showroom was basically full. In addition to about 8 Roadsters, several of which were customer cars, there was a completed-looking white Model S on the showroom floor. The pre-production Model S is a very pretty design, and it was very well assembled and finished. Aside from being a bit plasticky and plain inside, the interior looks like a proper luxury-sporty sedan, definitely more modern industrial style than plush Jaguar. The center console display is huge, bright and clear. 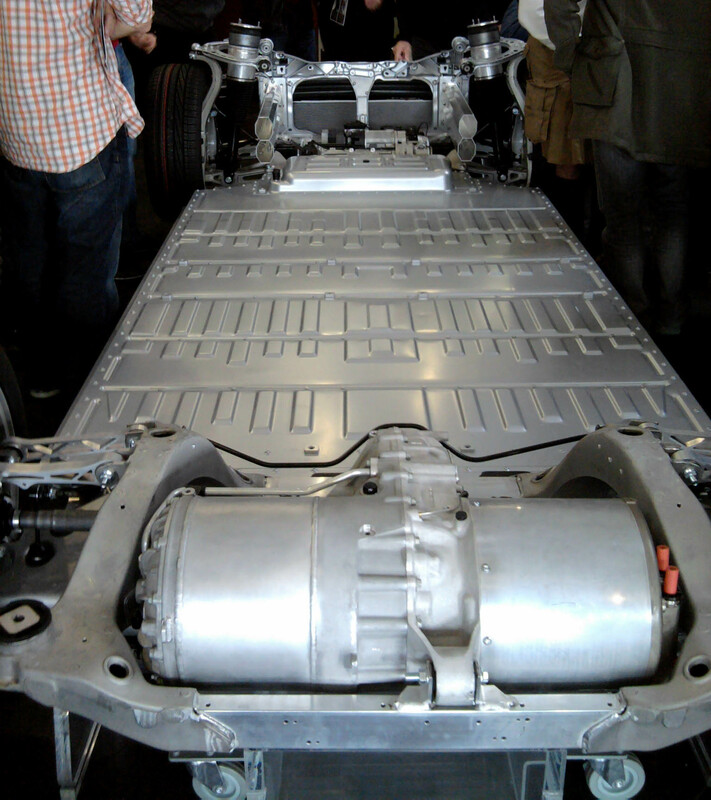 Next to the Model S is an empty version of its battery pack / drivetrain / suspension platform. At the back of the integrated platform (bottom of the picture below) is the motor and gearset / differential. On the other side of the differential is another cylinder that looks like a motor but turns out to be the inverter (AC motor controller electronics). The motor is actually behind the rear axles so this is technically a rear-, not mid-engine car. However the battery pack weighs much more than the motor, so most of the the mass is definitely between the front and rear axles. The suspension and subframes are Aluminum extrusions and castings. The front and rear subframes, which carry the suspensions and motor, are welded. Connecting them, the battery pack is a big, flat, low Aluminum box. The front suspension is double A arms with coilover shocks (dampers). Update: Since the lower part of the front suspension uses dual, bushed links instead of a monolithic A-arm, it's actually a virtual steering axis suspension. Front subframe side view. See the full platform view above for a better view of the actual suspension. The crossmember at the very front of the chassis (left side of picture above) is a very impressive, large, complex Aluminum casting. 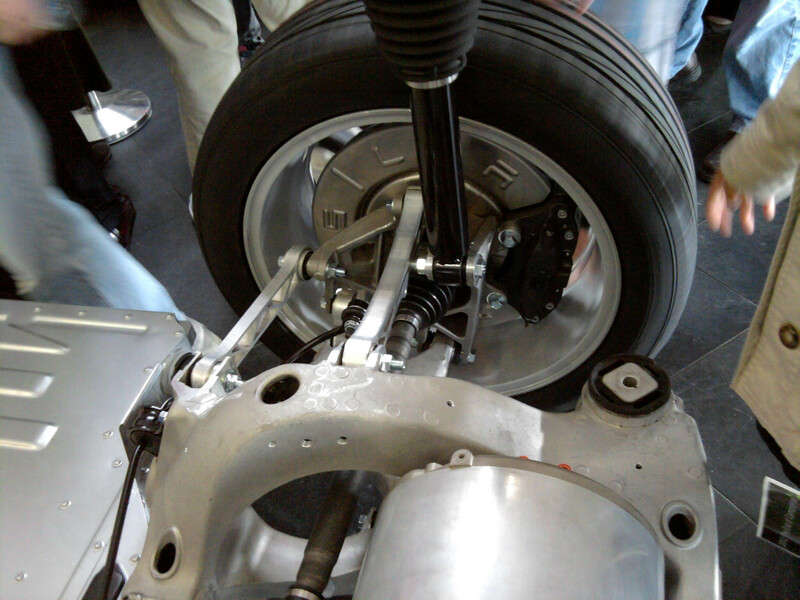 The rear suspension (below) is multilink with a lower A arm and upper lateral arms and coilover shocks. The main lateral arm is above the drive shaft, and the other lateral arm is in front of it, also functioning as a toe and camber control link. The upper lateral arms are actually short, wide extrusions which have been cut transversely. Each a little work of art, the lateral arms have gentle radii inside and out and trusses that gracefully follow the lines of force. The rear lower A arm has a pronounced tilt up toward the front of the car, which is an anti-squat geometry. The rear A arm is actually an H shaped casting. Rear suspension left and right sides. The rear subframe is mostly one large, complex casting. September 2017: The asymmetrical front suspension bushings may be part of a virtual steering axis arrangement, for example also seen on the Audi A8. A virtual steering axis allows for more consistent, communicative and precise steering feedback by controlling the behavior of steering geometry in relation to the tire contact patch under dynamic conditions of real world driving/racing. February 2018: Dan Edmunds is an automotive engineer at Edmunds.com who did a wonderful analysis of the 2012 Model S suspension. For engineering and racing types, it's not to be missed! Briefly: Model S suspension is highly sophisticated and has a virtual steering axis like Audis, and a multi-link rear suspension like Ferraris. Dan seems to agree with me that the rear suspension has a kinematic dynamic toe control function. One of the retail guys started the presentation with some background info about Tesla and the Model S, then turned things over to Nicolas Verzeni, Tesla's Powertrain Research and Development Manager. Not too much new information was revealed by either, frankly. Nicholas asked for a show of hands of people who had reserved a Model S and far more than a dozen people raised their hands. Really quite a few, and quite encouraging. He also asked how many Roadster drivers were there and a small handful raised their hands. He thanked the Roadster owners for being the backbone of the company. Nicholas had about a dozen slides which I couldn't see too well from my angle. He said Tesla took much of what it learned from the Roadster and improved on it in the Model S. The chassis is almost entirely Aluminum: stampings, extrusions and castings. The front bumper is Boron (high strength) steel. Almost everything else appears to be Aluminum. Nicholas said the battery pack is a structural member which helps stiffen the entire chassis, resulting in more accurate suspension performance. The front crash structure (crumple zone) was easier to optimize without an ICE engine present he said. (Note: the engines in ICE cars are designed as part of the crash structure and they do absorb some of the energy of a crash, though they are an additional element that needs to be accounted for, of course.) The front subframe is dominated by two large longitudinal figure 8 cross section extrusions which are clearly the major front crash absorbing structures. Nicholas said they crush progressively, absorbing lots of energy. 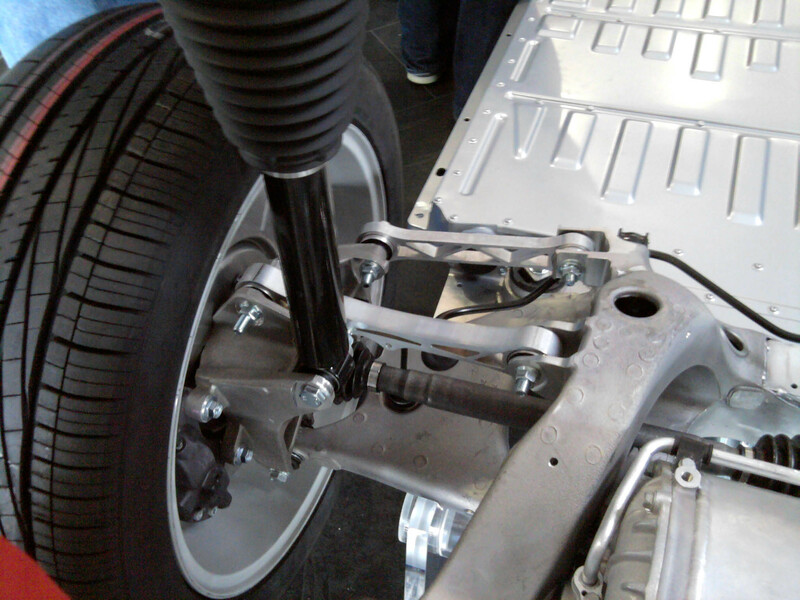 The rest of the front subframe has a cradle where a front motor could go, as in the all wheel drive version of the Model X, though they must relocate the crush tubes to clear the front driveshafts. Nicholas said the battery pack still uses 18650 laptop type Lithium ion batteries, but they are optimized specifically for calendar life and high power. I did not get a chance to ask him about calendar life during the chaotic question and answer period at the end. He said the pack is designed to have at least 70% of its capacity after 100,000 miles, but it depends on how the car is driven. The crash performance of the battery pack itself is also carefully engineered including a crush space for the cells and attention to deformation behavior of the large Aluminum container, Nicholas said. The container has a thick bottom plate with the idea that it would need to be strong enough to be struck by debris due to being at the bottom of the car, next to the road. The pack is liquid cooled, as are the motor and EV electronics. Nicholas said this is a more efficient way to handle cooling, and I agree wholeheartedly. So do GM, Toyota and Nissan in their EVs which are all AC motors and water cooled, like the Tesla second generation platform. The rear electronics and motor have their own cooling loop. The front cooling heat exchanger (radiator) is visibly tiny capacity compared to an ICE car, since there is so little waste heat from an EV, as we know. Liquid cooling is a departure from the Roadster, which followed AC Propulsion's practice of air-cooling the motor and motor electronics. Liquid cooling is more durable and reliable if slightly more complex. The Roadster is known for overheating its motor in atypical, sustained, high power use. It's nearly impossible to overheat a liquid-cooled motor and controller due to the vastly higher heat capacity of water/glycol solution compared to air. Heating in the Model S is resistive, and there's a conventional air conditioning for cooling. To me this is a low risk approach, but it's less efficient than a heat pump, which extracts significant amounts of heat energy from the air. The question about a heat pump was likely asked by one of our fellow RAV4 EV drivers since he identified himself as someone driving a car with a heat pump. Nicholas said the cabin heating and cooling would perform like a normal car. Our likely RAV4 EV driver also asked about window defrosting. Nicholas said it was done with hot air, i.e., conventionally (except for the resistive heat source for the air). This is a good, also low risk design decision since it's highly conventional and effective and doesn't require any exotic windshields like our RAV4 EVs have and the EV1s had. A question about regenerative braking was asked by a Roadster driver. Nicholas at first hedged suggesting that less regen would be used in order to meet efficiency requirements and user expectations about how a car should respond to the throttle, but he later backtracked and said driving the Model S would be like driving the roadster with respect to regenerative braking. For anyone who doesn't know, the Roadster has strong regenerative braking when lifting off the throttle at low speeds. It's touted as an advantage in not needing to use the brakes to slow except when coming to a final stop. At highway speeds, the aggressive regen is dialed back and is much less severe when coming off the throttle. Nicholas implied, correctly, that the Model S is designed for more of a mass consumer audience so the throttle behavior would need to be closer to what most people would expect. Accordingly Nicholas said the regen on the Model S would not be user adjustable, in response to a question. This implies that as EVs become more mainstream, they need to operate seamlessly, intuitively and without tinkering from their non-engineer drivers. He said the regenerative braking was not blended with the mechanical braking. All regen is controlled by the throttle, as in the Roadster (and Alan Cocconi's cars), and there is a dead position in the throttle response for enabling coasting. This is all unfortunate since it's one of the design errors that Tesla carried over from Alan, though Martin Eberhard did tell me earlier that they at least reduced the regen at high speeds on the Roadster. Hopefully the Model S will have less regen on throttle lift than the Roadster. As we all know, coasting is the most energy efficient off-throttle operating mode, and from a human factors perspective braking should be done with the brake pedal, not the throttle. Coasting is more energy efficient than regen since regen is not even close to a 100% efficient conversion of energy from kinetic to chemical potential. (If it were, then EVs would be perpetual motion machines which never needed recharging.) If one actually needs to slow, then of course regen should be used as much as possible, but otherwise it should be avoided due to the conversion losses. One of the marvels of the Toyota hybrid and EV cars is how well the regenerative braking is integrated with the friction braking. The improvement from the first generation Prius to the second generation Prius in the seamless quality of brake blending is one of the most notable aspects to me. It takes a lot of highly sophisticated engineering development to do well blended regenerative and friction braking. Our RAV4 EVs also have excellent brake blending. The EV1 brake blending was not as good as the RAV4 EV or later generation Prius models. 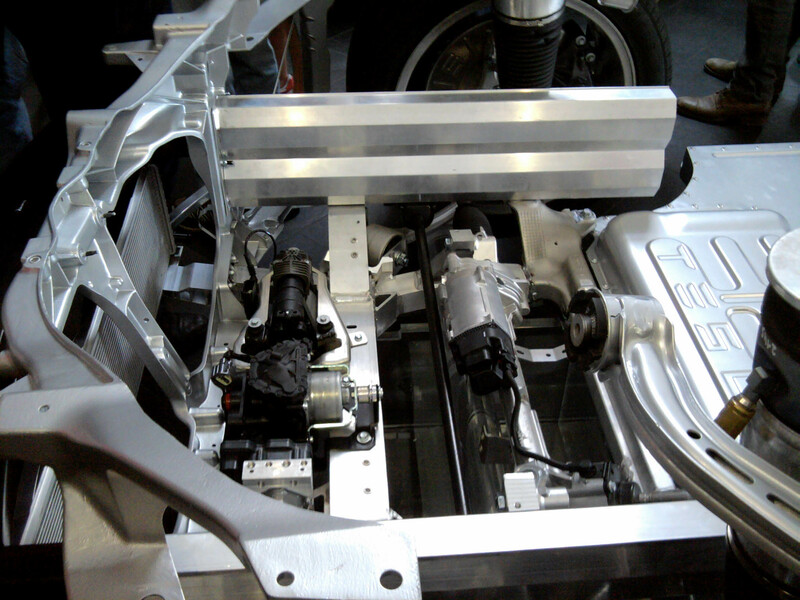 Unlike Alan's cars, the charging electronics in the Model S are separate from the motor electronics. Nicholas said in fact that there are two chargers. Presumably the separate inverter and chargers is due to the grounding isolation requirements for consumer electronics. The motor controller is opposite the motor in a cylindrical case that looks like another motor on the other side of the differential. This seems like a bizarre and unnecessarily complex way to package a controller. The charger electronics are in the middle part of the battery pack under the second row seats according to Nicholas. Nicolas said the touchscreen in the Model S is designed to be more intuitive and easier to use than an iPad. That would be quite an accomplishment. I can't recall if Nicholas mentioned that Tesla had hired some Apple engineers to work on such issues. During the question and answer period, the questions ranged from highly experienced EV users (probably our RAV4 EV brothers and sisters) asking detailed engineering and usage questions to underinformed questions of complete novices. The latter is actually a great thing if it means a much wider range of people getting EVs. It also means there's quite a bit of education about EVs that still needs to be done. Lots of questions came up about charge times, fast charging, J1772 compatibility, etc. Tesla's charge port is not directly J1772 compatible so a J1772 adapter cable is included. Tesla's non-standard connector works with their fast charger "supercharger", but the fast charger is more for commercial use and won't work in a home environment since it requires electrical service larger than a home would usually get. This is a somewhat unsatisfying answer since standards should be followed, and the connectors used for J1772 do in fact allow very high power (80 Amp) charging. Tesla should use the J1772 connector and sort out fast charging standards later. A counterargument could probably be made, however, that the J1772 standard is actually preventing high power charging using that connector now. To me, these concerns about charging mostly seem to derive from a lack of real world experience with EVs. Most of us long time EV drivers know that slowish 5kW overnight charging meets most of our needs. I understand that fast charging is desirable for some comparatively rare situations, and that it may enable longer trips, but it seems that the people who don't actually drive EVs yet perceive a greater need for fast charging than those of us who currently drive EVs. Nicholas mentioned that most Roadster drivers charge from a regular residential 240 volt (clothes dryer, stove) outlet in their garage at home, which I applaud. Even the J1772 EVSEs seem somewhat unnecessary to me, at least in a home environment where most EVs are charged most of the time. For public use a J1772 may be preferable for the greater safety interlocks, Internet charging telematics, billing, a much more robust connector, etc. There was more said, but these were my highlights. I came to the event mostly highly impressed with Tesla's design and engineering. I am even more impressed afterwards. The Model S and Model X should be outstanding cars, from the styling to the mechanical and electrical engineering, to the high performance and driving quality. Their car-body-on-top-of-integrated-energy-and-drivetrain-platform design architecture is a huge leap forward in car technology daringly suggested by GM's "Autonomy" fuel cell skateboards but never carried through there. (GM mentioned at the time that the skateboards could also use battery or hybrid energy.) Models S and X are a huge contribution to the quality and advancement of EVs. They are a stunning fusion of the highest technical arts applied to the traditional automotive form. Hopefully someday Tesla will get the brakes sorted out properly. It was wonderful to see the large turnout and a pretty diverse cross section of people, most of whom do not have an EV yet but hopefully will buy them. It's very important that there's significant uptake by new people. EVs can change the world, and this may be the start of the revolution, Leaf included.